THIS PRODUCT WAS ORIGINALLY RELEASED TO THE FOURTREKS PRODUCT LINE UP IN 2005. This Receiver Shackle Kit is the finest available. The body is CNC machined from heat-treated 7075-T6 billet aluminum. This material is harder and has 30% more tensile strength than 1018 steel. This kit is then topped off with an 8 ton, American made, forged carbon steel shackle. 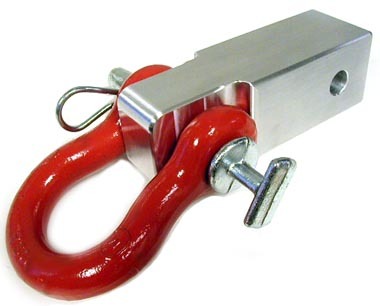 This shackle also features a heat-treated and zinc plated hitch pin. These pins have an easy to grip, t-shaped handle and are secured with a hairpin. It is perfect for rapid hookup and release.